Injured in a Crab Boat Accident? Numerous crab fishermen suffer serious injuries or meet untimely deaths every year in North American waters. Many of these injuries and deaths are preventable with proper equipment maintenance and appropriate crew training, but too frequently, ill-maintained equipment breaks, or an untrained deckhand or other crewmember makes a grave error. 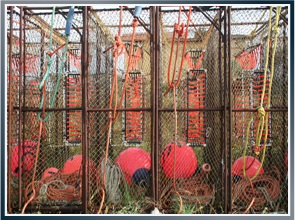 Because crab fishery is so competitive, particularly in Alaska, boats go out in even extreme weather, leading to many on-deck accidents. Fishermen on crab boats are required to work many hours each day, leading to mistakes caused by excessive fatigue. These conditions often result in very serious maritime injury or, sadly, someone´s death. Lost wages. Injured crab fishermen may be entitled to the wages they lost between the time of the accident and the time the doctor allows them to return to work. If you are released to go back to work but you cannot go back to fishing, you can get damages for impairment of your earning capacity; if you cannot go back to work at all, you are entitled to future lost wages. Emotional damages. You may be entitled to money damages for pain and suffering, mental anguish and physical disfigurement. Future medical costs. You may be entitled to money for the medical treatment, medical equipment and medical care you will need in the future. Maintenance and cure. Regardless of fault, crab fishermen are entitled to maintenance and cure as long as they can prove their injuries occurred in the course of their employment. That means that even if there was no negligence and the vessel was seaworthy, you can still get maintenance and cure payments if you were hurt on the job. Maintenance is a daily money stipend you receive from your employer to pay for room and board your employer would have provided if you had not been injured. Your employer must pay maintenance until you reach your maximum medical recovery; when you are as healed as you will ever be, the maintenance ends. Cure means that your employer must pay all your medical bills until you reach maximum medical improvement and cannot heal anymore. The maritime attorneys at Latti & Anderson LLP have helped crab fishermen from all over North America including those working in Alaska. Our maritime and Jones Act lawyers have successfully represented crab fishermen under the Jones Act and other general maritime laws. Whether you are a deckhand from New England or an engineer in the Bering Sea, we can advise you and help you receive damages if the unthinkable happens. We have been helping those injured at sea for over 50 years, and we can help you. Whether you need assistance obtaining maintenance and cure or fighting a Petition for Limitation of Liability, our maritime and Jones Act attorneys have the knowledge and experience to give you legal counsel and peace of mind. Contact our maritime trial lawyers today and tell us about your case. We represent clients nationwide.